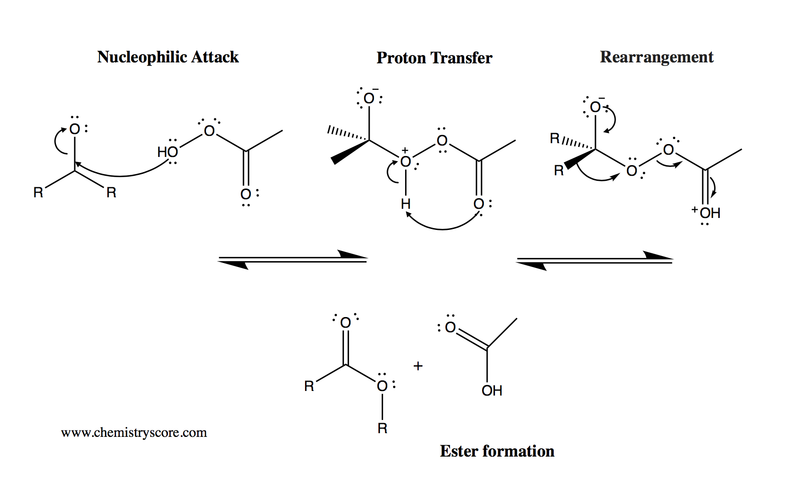 The definition of Baeyer-Villiger Oxidation is a reaction that forms an ester from a ketone by the insertion of an oxygen atom, usually via peroxyacids or peroxides acting as the oxidants. The same reaction can be done for cyclic ketones, which yield a cyclic acid (lactone). The mechanism of action consists of a nucleophile attack on the carbonyl group, via the peroxyacid/peroxide. This enables the intermediates to transfer protons intramolecularly. After rearrangement of the carbonyl group, the ester is formed with a by-product of an alkyl group.